Make your own DIY bath bombs with this easy recipe. With only a few simple ingredients, you’ll have your own bath fizzies that kids and adults alike will enjoy. There’s nothing more relaxing than a warm bath at the end of a busy day, right? And if you love dropping one of those fabulously scented (and colorful!) Lush bath bombs into your tub and watching it explode and fizz under the running water, then you’re going to love how easy it is to make your own homemade version! Bath bombs also make a fabulous gift for every ocassion. Whether it’s a new school year gift for your kid’s teacher, a birthday present or (dare I say it) a holiday gift, I the recipient will be pretty happy with them! Yes, you can purchase them in the store but at $7 – $10 each, they are pretty expensive. If you make these bath bombs in bulk, they work out at only around $2 a piece! 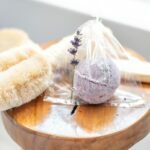 For this recipe, I chose to make Lavender Bath Bombs because I find lavender to be extremely relaxing. I added Lavender Essential Oil and Dried Lavender to the mixture, but you can add whatever you want. I also used this plant-based food coloring because I don’t want nasty artificial colors in my body products. But regular food dye works perfectly fine if it doesn’t bother you. What Can I Use Instead of Citric Acid in Bath Bombs? I know many of you will ask if you can make these Bath Bombs without the citric acid. Citric Acid is readily available on Amazon and is essential to get the fun fizzing effect, but Cream of Tartar will create a somewhat similar effect (not nearly as dramatic, though!). If you use Cream of Tartar, I think you’ll also possibly be able to make the recipe without corn starch. I haven’t tried it, so I’m not sure what the ratio of ingredients would be. Make sure you’re using Epsom Salt and not regular salt, too. Epsom Salt is full of magnesium which has amazing relaxation properties. You can pick up 5lb bag at any pharmacy for only a few dollars. You’re going to want some sort of mold for these DIY Bath Bombs. I purchased these round metal bath bomb molds, but you could use one of those clear plastic Christmas tree ornaments or even a silicone mold depending on the shape you want. There’s many recipes floating around the internet for DIY bath bombs and I tested several out. Many of them did not work as well as promised. But finally, through trial and error, I’ve figured out the best recipe for your own personal bath fizzies! Make your own DIY bath bombs with this easy recipe. With only a few simple ingredients, you'll have your own bath fizzies that kids and adults alike will enjoy. In a bowl combine the dry ingredients (baking soda, cornstarch, epsom salt and dried lavender). Whisk to remove any clumps. You want the mixture to be very fine, so rub any lumps together with your fingers to remove them if necessary. In a small bowl, mix together the water and coconut oil. If you're using liquid food coloring, add a couple of drops here. I used powdered, plant-based food coloring so I added it at the very end. Slowly pour the liquid mixture in with the dry mixture, whisking as you go. If you see the mixture begin to fizz or foam, you're adding it too quickly. Add about 20 - 30 drops of essential oil, depending on how scented you want your bath bombs. Once all the wet ingredients are combined with the dry, take a small amount in your hand and squeeze it together. It should stick together, almost like damp sand. If the mixture is still a bit powdery, add another drop of water. If you're using powdered food coloring, now is the time to add it. Sprinkle some and whisk it together with the rest of the ingredients. Fill each mold with the mixture until they are slightly overfull. Then press the molds together. Allow to bath bombs to dry for an hour before trying to remove the mold. You want them to dry outside of the molds because they will stick and crack otherwise. If after an hour, they break when taking them out of the mold, just stick them back together and allow to dry for another short while. You can also pop them in the fridge for a few minutes. Once the bath bombs have been removed from the molds, allow them to dry on a tray overnight. Once dry, store in a Ziploc baggie or pop them in some cellophane for a pretty gift!